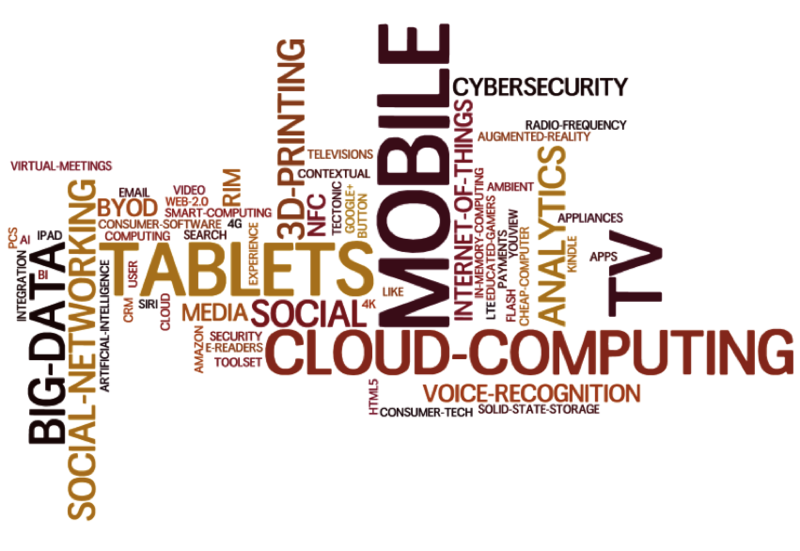 This wordle was generated from texts abstracted from mentions of key technologies in a collection of more than 20 articles and blogs on technology predictions for 2012, which I gathered through Google search recently. These predictions were produced mainly by individuals and organisations from the IT and business sectors. First, I extracted the main topics from each article and blog as the basis for creating the wordle. Then I did a bit editing work in order to create a more accurate wordle presentation. For example, I added “-” between two or three words (e.g. cloud computing as cloud-computing) or “s” to words in the singular (e.g. tablet as tablets) and using a common name for same technology that has appeared in different forms (e.g. using cloud-computing instead of cloud service or cloud based technologies). 1. Mobile and tablets are continuing to grow and BYOD (Bring Your Own Device) is increasing as more people use their own devices for work. Organisations will embrace that trend and proactively develop a stance and policies on BYOD to better manage, secure, maintain, and deploy mobile devices and applications within their organisations. 2. TV is being integrated with other devices to make it “mobile, local and social”, e.g. controlling your TV with smartphones, tablets and Microsoft’s Kinect. Internet TV and IP TV become embedded into the mainstream. Apple will launch Apple iTV to provide the next generation of television experiences. 3. Cloud computing continues to be the top IT investment priority for organizations; the scalability, flexibility and IT cost benefits of cloud computing become more apparent. 4. Big data and analytics are going mainstream. Businesses and government agencies alike are adopting big data and advanced analytics technologies to build innovative new services, improve service levels, and drive greater efficiency to provide better service for customers, open new markets and reduce costs. 6. The next generation of social networks, e.g. Facebook, Google+ and Twitter, will continue to redefine how we interact with each other online. Advanced social networking technologies will be widely used in business to enhance collaboration between employees and improve efficiency and overall service levels in organisations. 7. Desktop 3D printing has caught the attention of the public. There will be cheaper and improved 3D printers, innovative user interfaces for model manipulation which make it possible for them to be used at home, schools and universities. This work intends to provide a quick update to the 2011 JISC Observatory’s “Technology Forecasting Literature Review”. Although we have covered most of the topics in the report, several technology trends appearing in the wordle might be worth further investigating, e.g. Big Data, 3D Printers, the next generation of TV, etc. For more detailed analysis of the technology predictions in 2012 and onwards from the IT and business sectors, please go to the google docs to see all the topics extracted from the articles and blogs and follow the links to the original websites. It is also worth noting that the NMC has just released its NMC 2012 Horizon HE Report, which identified mobile apps and tablet computing as technologies expected to enter HE mainstream in one year or less. This entry was posted in JISC Observatory, jiscobs. Bookmark the permalink.